About that 2014 project plan: 100% market-rate buildings were to cluster around the "park"
I never highlighted this, but it's dramatically clear: had Atlantic Yards/Pacific Park been built out as contemplated in 2014, five of the seven buildings on the eastern end of the site--surrounding the largest segment of open space--would have been 100% market-rate, dominating access to the central open space, or "park." Take a look at the graphic below: three buildings with condos, two with market-rate rentals, one "100% affordable" (though significantly middle-income), and one 50-30-20, with 50% market-rate units. Meanwhile, three buildings over the center block of the railyard, with more limited green space, would've been 50% affordable (50/30/20) buildings. At the time, no other market-rate buildings were planned for any other part of the project. Priority access to the park? 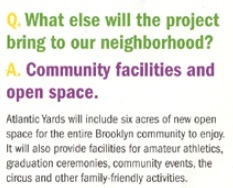 In other words, the "park," long touted as a gift--"Atlantic Yards will contain six acres of new open space for the Brooklyn community to enjoy," a 2004 flier proclaimed, excerpted at right--would've gone first not just to residents of the megaproject, as we long expected, but particularly to those paying the most for their apartments. First, the amount of open space was increased, ultimately to 8 acres, though it should be noted that the enormous amount of new residents means the amount of open space would be well below the city average, much less the recommended amount. 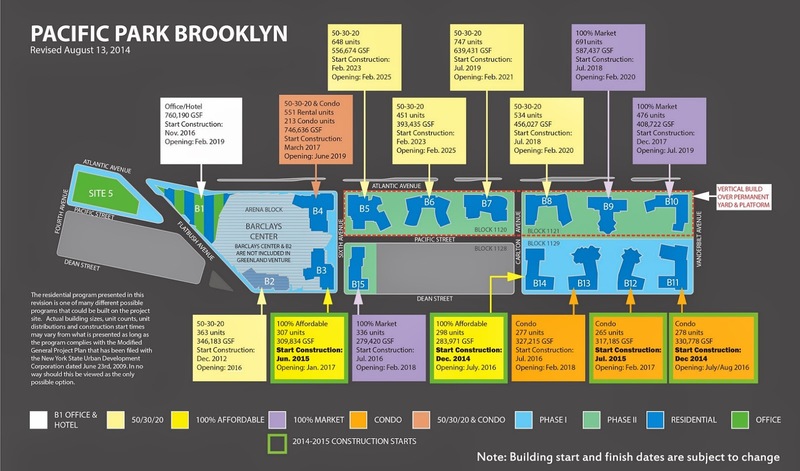 Another thing is that the timing of Atlantic Yards, now Pacific Park, has changed. It was long supposed to take ten years, including after approval in 2006, but the Development Agreement, signed in late 2009 after the project was revised and re-approved, set 2035 as an "outside date"--a 25-year span. In 2014, a settlement agreement, reached upon threat of a lawsuit on fair housing grounds regarding delays, imposed a May 2025 date to deliver the affordable housing. Developer Greenland Forest City Partners, then owned 70% by Greenland USA, produced the above map, which contemplated delivering that affordable housing while building the entire project by 2025. As part of that 2014 agreement, the developer agreed to build two 100% affordable towers (B14, B3), albeit skewed toward middle-income units. A 50/30/20 building (B2) was already in process, and a condo tower (B11) already launched. Those are the first four towers built. Not long after that agreement, in July 2015, we got a look at the "park," as designed by Thomas Balsley Associates. 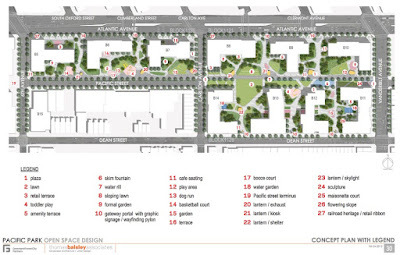 While it portrays green space adjacent to B5, B6, and B7, especially on Pacific Street between Sixth and Carlton avenues, the heart of the open space would be along the former streetbed of Pacific between Carlton and Vanderbilt avenues, between two sets of towers. 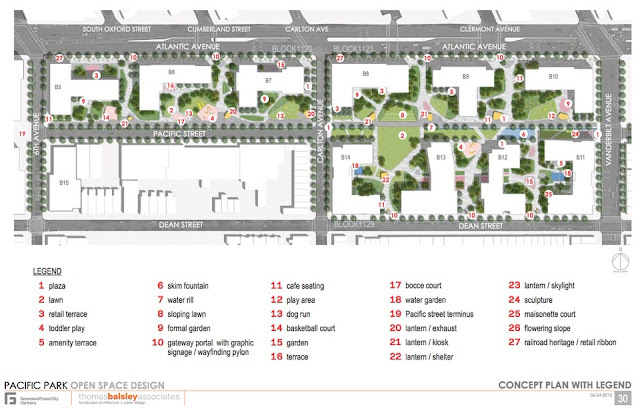 2015 design, via Thomas Balsley Associates: Note: no green space shown at B15, the building with the school. The timetable quickly fell behind, though. In 2016, minority partner Forest City Ratner unilaterally announced a pause in construction, citing a glut in market-rate units nearby, increasing construction costs, and uncertainty about the 421-a tax break. Thanks to the "Atlantic Yards carve-out" from 2007, the 421-a tax break had been available to any building in the project, even if it was 100% market-rate, as long as the project's overall affordability level met a certain threshold. But that carve-out was gone, upending plans for condo buildings or even 100% market-rate rental buildings, leaving lots of question marks, as indicated in the graphic below. A key question is how the developer will reach 2,250 affordable units. As I wrote, current plans for the B4, B15, B12, and B13 towers should add enough affordable units to reach 1,334, leaving 916 remaining. 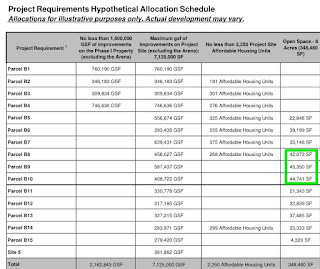 But reaching 2,250 by building six towers over the railyard seems very unlikely, at least with 30% affordability, the maximum under the Affordable New York plan. "Greenland Forest City is in design of B5, and commencing design of B6 and B7," Greenland's Scott Solish said at the 3/15/19 Atlantic Yards Community Development Corporation meeting, "so we'll be coming back with additional information as that design progresses." Let's look at the numbers, at least according to the 2014 plans. B5 would contain 648 units, B6 451, and B7 747. At 30% affordability, that aggregate 1,846 apartments would generate 554 affordable units, not 916 ones. Beyond claiming delays, there might be two solutions here. One might be to include affordable units in additional towers, such as at Site 5, currently home to P.C. Richard and Modell's, and previously promoted as a potential office tower, albeit with some residential options. Another might be to increase the affordability percentage, perhaps thanks to a special agreement or the "100% affordable" model--which skews toward middle-income units--among those next railyard buildings. Again, if that followed B14 (535 Carlton) and B3 (38 Sixth), with mostly middle-income units, it would depart from the project's original promised configuration. If one of those latter paths satisfies the 2,250 affordable threshold before last three towers over the railyard are built, that leaves room for the remaining buildings to include only market-rate units. 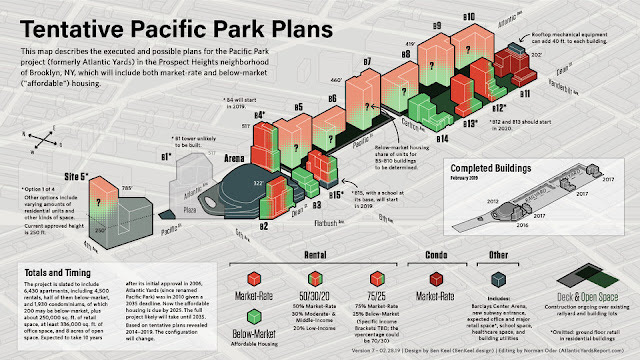 Thus a variant of the 2014 skewing might recur: the majority of apartments facing the "park," the largest segment of open space, might will be occupied by market-rate residents. As noted in the graphic below, more than three of the eight acres of open space is assigned to the three buildings at the northeast block of the site: B8, B9, and B10. If so, it certainly makes sense, from a leasing or condo-selling perspective, since the open space offers a bonus to residential dwellers. It just departs significantly from the egalitarian vision once promulgated but long diminished. Maybe that wouldn't happen. It's possible that that only way to build, assuming current subsidy programs continue, would be to have 25% or 30% affordability in rental buildings, with no more condos. If so, Atlantic Yards/Pacific Park might wind up with more below-market units--still, likely skewed toward middle-income ones--than originally promised. Or, perhaps, maybe the developers would get an exemption, arguing that they'd already produced the affordability percentages--however skewed--long promised. Stay tuned. After all, Atlantic Yards is a "never say never" project.